What a disappointing loss, there’s really no way around it and no real positive spin you can place on a loss to a team that had no business winning this game (in theory). In a spot where you’ve got a real challenging stretch ahead the Griz looked unprepared, unable to execute, and obviously full of mistakes. When you look at teams that want to play in the post-season they have those “must win” games where even if they were ugly AF, they were still wins. 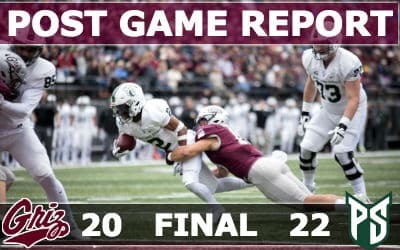 Today’s loss push the Griz to the wrong side of the bubble and backs them up with now having the need to put together a long string of wins to get back into the post-season talk. – 2 first downs in the first half, and an opening 7 first possessions that resulted in either a lost fumble or a 3 and out. – 19 of 22 PSU’s points scored off turnovers and the other 3 came off a blocked punt. All those errors and the Griz were still in a position to get away with a win, that’s something. This was a head-scratcher of a game honestly. The game plan on offense didn’t work. Portland put 8 in the box with a spy on Sneed and it totally disrupted the offense for far too long. Sneed in-turn was waaay off missing throws quite a bit and then unfortunately having to deal with a lot of drops as well at times when he was on the money. The O-line protection took a step back too and the OL had to deal with more injuries as well, so more shuffling around. Beyond that the jet-sweep 2-point attempt baffled me, just put the offense out there, the percentages are better, the Griz were running for 5 yards per carry. And then the 4th and final killer fumble by Curran, again, just run the damn ball and if you don’t get it, kick the fieldgoal and walk out of that stadium with the win. I know Hauck in his post-game shouldered a lot of blame for this loss and while there’s plenty to spread around… some of these errors do fall on him. Also, the blocked punt, I may have counted it wrong but I believe PSU had just 10 guys on the field. What’s crazy to me is that right now this team should be 6-0. While the offense was a big let-down the defense did their damnedest. Having played 2/3s of a game last week and having to do it again today they were continually put in bad spots by fumbles and a blocked punt. They forced 3 turnovers of their own, had several big stops, and even on the 2nd to last play of the game they got through the PSU O-line to knock them back a few yards (although in the end it didn’t matter). – Dante Olson should just be given the Buck Buchanan award, oh man. 19 tackles and 2 forced fumbles today plus a half sack. This guy is an animal and I love watching him play. I keep thinking he can’t keep up this pace of play… but he does. We’re damn lucky to be able to watch such a talented guy come of age for this team. – Adam Eastwood didn’t put up the numbers he did last week but I still thought he showed more good stuff and improvement as the main running back for this team. He’s seeing the field much better than he was earlier in the season and has really molded into the feature-back that Bobby wants on a team. – Sneed and Toure finally connected! Was really starting to wonder if/when they’d link up for a deep shot. – This defense really puts LBs and DBs in a great position to make plays. Buss and Lewis had great days, as did Miller and Hauck. These guys continually hit hard, didn’t quit on plays, and drove through the ball carriers. – While there’s plenty of ST concerns there was one play that showed me what these coaches and players are continually working on. After the Griz went up 20-19 on the ensuing kick it was a bounce and roll kick that the PSU returner cut to the far side of the field. Evan Epperly, smartly, never left his lane and closed off what could’ve been a very long return. Instead Ep forces the returner back inside and he’s stopped short of the 20 yard line I believe. – I liked the use of Sulser around the field, especially in the 2nd half which forced PSU to peel off the spy on Sneed a lot. Now this UND road trip feels like a must-win. Griz need to regroup, learn from these mistakes, and bounce back fast. I have faith that these players and the coaching staff will do all they can to make it so, and will be ready to roll next week at UND.